In the right corner we have Killer the Chihuahua. In the opposite corner is Brutus, the Rottweiler. If you’ve ever shared your home with a small dog, you may have experienced your pet picking on the big guys. There could be several reasons why this happens. We often treat small dogs like breakable toys, much differently than we act with their larger counterparts. Known as “small dog syndrome” we sometimes forgo proper training and socialization. We tend to pamper our little pets, carrying them around and allowing them to get away with things we never would with our big dogs. Some small dogs were bred to be lap animals, but most were bred for certain jobs. Small dogs can reach places that large ones can’t. They are able to burrow into areas, hunting prey such as vermin and can be tenacious in their quest. 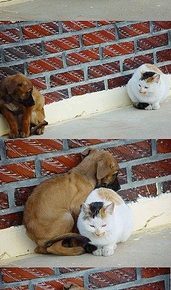 Many small breeds are excellent watchdogs, bravely defending their humans and territory with fierce resolve. Positive socialization and obedience training are just as important for small breeds. Small dogs can feel threatened or stressed or nervous around a large dog or a new situation. This in turn can create fear aggression which leads to fighting. The outcome would not be good for your small pup. 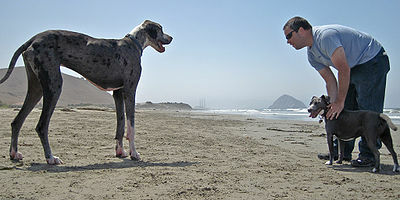 To avoid the small dog syndrome, treat your dog as though s/he were a Great Dane. Positive obedience training, teaching the basic commands, and socialization with other dogs of all sizes (humans too) should make your dog much more pleasant to live with. 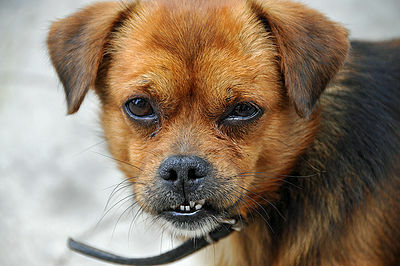 As it turns out, researchers have discovered that small dogs show more aggressive tendencies than larger dogs. Large dogs who have been bred from small dogs may be more aggressive. Is it nature or nurture? Perhaps some of both. We have a situation at my house with small dog vs. large dog. When my daughter’s pug comes to visit, she invariably chooses to stand in front of my 110 lb. German Shepherd and bark at her for what seems like hours (I exaggerate a bit). Pugslie was adopted by my daughter when she was 5 yrs. old and already had ingrained habits. But we continue to work on her manners. Luckily, my German Shepherd is very tolerant and mainly ignores this annoyance.